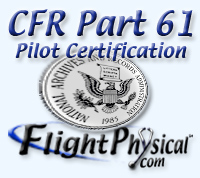 § 61.75 Private pilot certificate issued on the basis of a foreign pilot license. (a) General. A person who holds a current foreign pilot license issued by a contracting State to the Convention on International Civil Aviation may apply for and be issued a private pilot certificate with the appropriate ratings when the application is based on the foreign pilot license that meets the requirements of this section. (5) Is able to read, speak, write, and understand the English language. If the applicant is unable to meet one of these requirements due to medical reasons, then the Administrator may place such operating limitations on that applicant's pilot certificate as are necessary for the safe operation of the aircraft. (c) Aircraft ratings issued. Aircraft ratings listed on a person's foreign pilot license, in addition to any issued after testing under the provisions of this part, may be placed on that person's U.S. pilot certificate. (3) The person is able to read, speak, write, and understand the English language. If the applicant is unable to meet one of these requirements due to medical reasons, then the Administrator may place such operating limitations on that applicant's pilot certificate as are necessary for the safe operation of the aircraft. (4) Shall not exercise the privileges of that U.S. private pilot certificate when the person's foreign pilot license has been revoked or suspended. (f) Limitation on licenses used as the basis for a U.S. certificate. Only one foreign pilot license may be used as a basis for issuing a U.S. private pilot certificate. The foreign pilot license and medical certification used as a basis for issuing a U.S. private pilot certificate under this section must be in the English language or accompanied by an English language transcription that has been signed by an official or representative of the foreign aviation authority that issued the foreign pilot license. (g) Limitation placed on a U.S. private pilot certificate. A U.S. private pilot certificate issued under this section is valid only when the holder has the foreign pilot license upon which the issuance of the U.S. private pilot certificate was based in the holder's personal possession or readily accessible in the aircraft.